We've completed our first session of Checker School, which was a tour through Ben Boland's Famous Positions in the Game of Checkers. For our next session, we'll turn (at least at first) to an unusual book published by Andrew J. Banks in 1945, called Checker Board Strategy. Mr. Banks, who lived in Washington, D.C., evidently self-published his work. The book is written in an entertaining style and features a number of fascinating fictional players. We'll get to meet them as the months roll by. Mr. Banks starts out with the rules of checkers (compiled by none other than William Ryan) and then continues with a brief games section that illustrates the basic openings. Next is a section he calls Snappy Problems (Gems) Today, we'll look at the first one and along the way make the acquaintance of Nemo and Skittle. Nemo had been studying the foregoing games (in the Games Section--Ed.) when Skittle exclaimed, "You are learning checkers the hard way. You are like a tourist I saw in the State of Maine; he stoped a native and inquired 'How far is it to Portland?'" "How far was it?" Nemo asked. "The way the tourist was headed it was about 25,000 miles. The native told him that if he would turn around and go the other way it would be only about two." "You be my guide; show me the quick way to learn the game," said Nemo. "By solving problems you will be learning checkers the quick way." 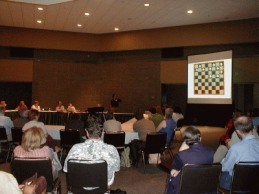 Champion player Alex Moiseyev flatly states that beginners should not touch opening books until they have played a large number of games; many other checker greats stress the value of solving problems. So, the first "gem" or "snappy" problem proposed by Mr. Banks is this one, by G. M. Gibson. Can you solve the problem proposed to Nemo by our new friend Skittle? Make it snappy! Solve it and then snap your mouse on Read More to check your solution. 30-26 4-8---A 26x19 8-12---B 2-6! 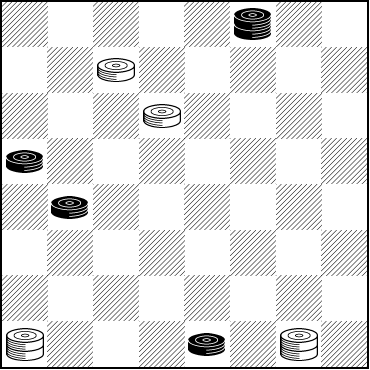 1x10 19-15 10x19 16x32 Black Wins. A---23-18 16-19 is a quick Black win. The main line is trickier. B---Very cute. Black must give back his extra man, for if 2-7 then 1-6 7-11 6-9 11-15 9-13 (not 9-14 15-18 Drawn) 15-18 13-17 and Black is doomed. A very nice problem indeed! We do, however, have to ask if it is perhaps a little too difficult for a beginner. We'll have more from Mr. Banks in the coming months. You can email the Webmaster with comments on this article.